Everyone knows Black Friday means deals. Cheap TVs, cheap headphones and cheap sneakers. After analyzing more than 1.4 million prices of 4,024 sneakers from more than 200 retailers on RunRepeat over the past two years, it turns out just 1% of all sneakers are cheapest on Black Friday. 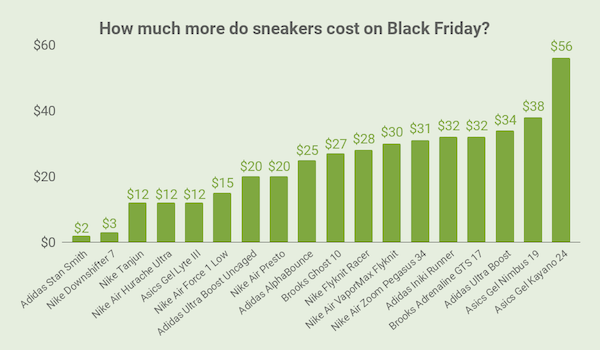 Only 1% of sneakers are cheaper on Black Friday than any other day. On 292 out of 365 days (80% of the year), shoes are cheaper than they are on Black Friday. 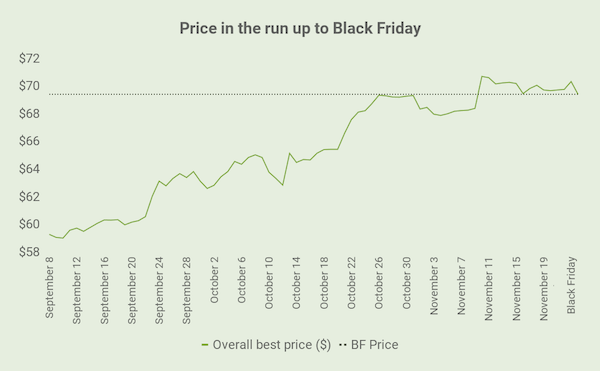 Prices gradually rise by 17% in the 10 weeks leading up to Black Friday. You can expect to pay $29.72 more per pair of sneakers on Black Friday than the cheapest price available throughout the year. How can you get the best price for your sneakers? Try throwing darts at a calendar. Maybe read your tea leaves, or ask your local water diviner. Whatever method you come up with, you’ll probably pay less for your sneakers than if you waited for Black Friday. That’s because, on 292 days (80%) throughout the year, it’s cheaper to buy shoes than it is on Black Friday. If you choose 10 days at random throughout the year, the sneakers will be cheaper on 8 of those days than they are on Black Friday. When looking at the most popular sneakers in our database, they are all more expensive on Black Friday than they would be on any normal day. You can expect to pay $29.72 more for your sneakers on Black Friday. To combat the harm done by discounting, retailers gradually increase the price of their products in the months leading up to Black Friday. As you can see, the price of sneakers gradually sneaks up in the two months prior to Black Friday -- 17% over 10 weeks. 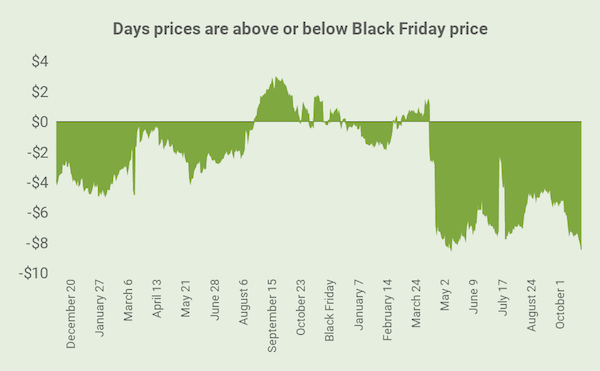 Retailers know shoppers just assume things are going to be cheaper on Black Friday, so they gradually creep the prices up before Black Friday and hope you just don’t notice. And, it seems they’re right. Consumers do not save money on Black Friday. The data doesn’t lie. 99% of all sneakers are cheaper on another day than Black Friday. All data is publicly available in this spreadsheet. If you want more detailed data, reach out. Prices include all 1749 running shoes and 2275 sneakers at RunRepeat. For any questions about the data or this article, contact Danny at danny@runrepeat.com. Danny is a sneaker expert at RunRepeat, exploring all things sneakers from a business, culture and style point of view. He has spent years consulting on business processes for top retailers in Europe -- so he has the inside track on all the tricks of the trade.